The visual system integrates visual inputs in a context-sensitive fashion and constructs a coherently organized whole. Although this is one of the most prominent aspects of human vision, the underlying neural mechanisms are still not fully understood. How integrated representations arise at the neural level remains elusive. To provide additional insight on this issue, we investigated the neural correlates of different types of Gestalts in which the whole requires the integration of visual information about the parts. Specifically, we applied high-density electroencephalography (EEG) by collecting steady state visual evoked potentials (SSVEPs; Regan, 1966) in combination with the technique of “frequency tagging” (Regan & Heron, 1969) to different Gestalts. SSVEPs are the periodic neural responses to a periodic visual stimulation and the “frequency tagging” technique allows us to detect the neural activities corresponding to separate parts of the input images modulated at different frequencies (i.e., physically given fundamental frequencies). 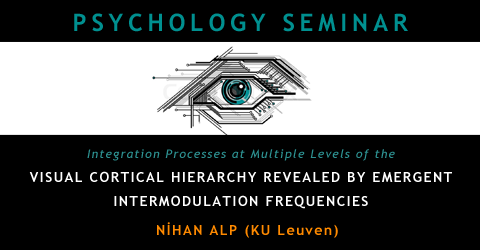 Most importantly, nonlinear intermodulation (IM) frequencies (e.g., summation of two input frequencies or differences between them and their harmonics), which emerge as a result of the interactions at the neural level, may appear in response to global configurations in Gestalt formation. In this talk, I will present three studies in which we identified specific IM components as objective neural markers for different types of Gestalt formation.